To express your Rock Soul, Heart Rock suggest you the Classic Leather, as the best accessory to wear! Realized with the best black smooth leather, certified with the brand Made in Italy, is a symbol of identity that stands out who wear it; Classic Leather is characterised by unique textures among original weft and studs of different type and size (pyramid, cone, bullet and K studs), but all in a shining steel colour. 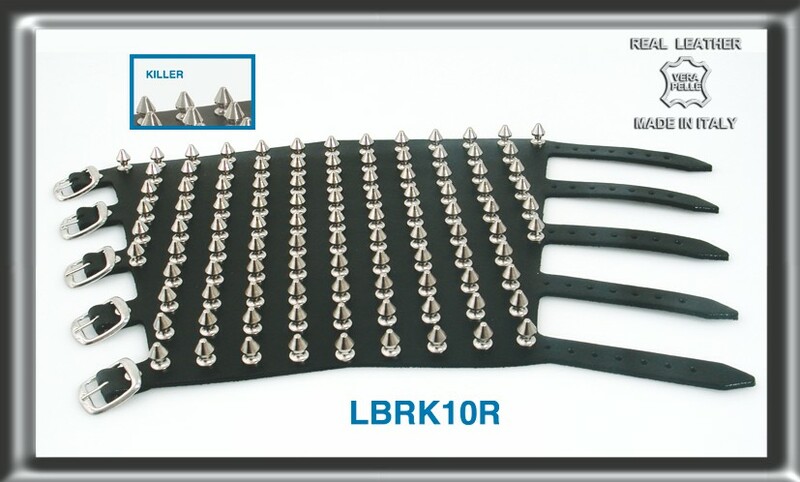 The different types of latch (buckles and buttons) are tested for a working well closing; the black leather used is treated in order not to feel uncomfortable when you are wearing the accessory; but also the different studs passed some controls in order not to have some components that get caught on your clothes or hurt your skin. The accessory Classic Leather, has shown, has specific characteristics that you can see in the belts, wristbands and Necklaces that you are buying, is a quality product all Made in Italy and is well-finished in all its details, to give that unique feature to your image. The accessory that you see in the image is the accurate reproduction of what you are going to buy, a well-finished and exclusive product.